A hearty weekday meal doesn’t have to take forever to make, or come out of a box. 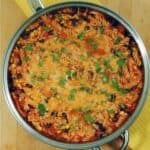 This One Pot Mexican Chicken Pasta is hearty and bursting with all of your favorite Mexican flavors, plus it will be done and on your table in 30 minutes. With the added bonus of fewer dishes to clean it is a win/win in my book any day! This recipe was first published in full on the blog Bobbi’s Kozy Kitchen. 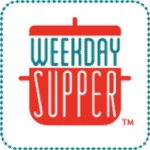 We are pleased to share it with you here for Weekday Supper. Add the shredded chicken and taco seasoning. Stir to coat the chicken and to warm it a bit, then add the pasta, salsa, chicken broth and crushed tomatoes. Bring to a boil, then reduce to simmer and cover until pasta is cooked through, about 15 minutes. Stir in corn and black beans, and gently toss to combine. Cook for an additional 2 to 3 minutes, until the corn and beans are heated through. Stir in 1 cup of the cheese, just until melted through. I am a writer, recipe developer, and photographer, living in the Pac Northwest. If not making a mess in my kitchen, I am enjoying the beauty outside. I am addicted to mac & cheese!